Like lots of us, I fondly remember my Mum’s cooking from when I was a child. These were my favourite cakes (and still are!) They were originally cooked on the hot plate of a coal oven (my Granny had a Rayburn stove in her kitchen) but can easily be cooked in a heavy non-stick frying pan, bakestone or griddle. As they are quick and simple to make they are an ideal introduction to cooking for children as they all like cakes! Note – Whilst she has suggested a cooking time below, that’s just a starting point; Mum’s advice is that you use sensible judgement and experience! Unless you burn them really badly they will all be edible. Sieve the flour, salt and spice into a mixing bowl. Rub in the fats until the mixture looks like fine breadcrumbs. Add the sugar, lemon rind and dried fruit. Pour in the beaten egg and stir to make a firm dough, add a tiny dash of milk should the dough be too dry. Add a tiny amount at a time to prevent creating a sloppy dough. On a floured board, roll or press the dough to approximately 1/4″/5mm thick, approx the thickness of the little finger. Cut into discs with a 1 1/2″ or 2″ /4 or 5 cm cutter. 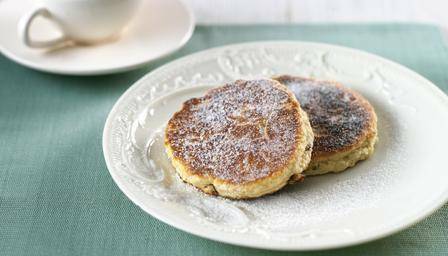 Bake the Welsh Cakes on a lightly buttered medium hot griddle bakestone or thick frying pan for approx 3 mins per side turning once, until golden brown on both sides but still a little soft in the middle. If you wish you can dust with fine/caster sugar while still hot – I think they are great without though!